a Cheerful Spot | A dose of sunshine, even on cloudy days. A dose of sunshine, even on cloudy days. And just like that, the holiday season is in full swing! It is a season full of lovely things: time spent with friends and family, joy and cheer, and giving and giving and giving until your heart (and wallet) are as light and full as a helium filled balloon. However, all of this goodness does come with a disruptions to our day-to-day lives, stress, extra tasks, and the onset of cold and flu season. Yay! Wait… really lady?! Yeah. I had to go there. So here’s the thing, we can totally combat the negatives, starting RIGHT NOW! Then we’ll get to really, truly enjoy all the good stuff the season brings. A lot of things come down to planning, but you know what they say about the best laid plans… Anyhow! You cannot totally avoid all the things that add stress, even with great planning. Adding exercise and eating well will definitely benefit your physical and mental states. However, what I’m suggesting here will not add to your Holiday season induced time crunch (and subsequent panic)! I know, I know. We’ve all heard it before. It’s good for you, it takes practically nothing from you and gives you so much in return. And, quite frankly, that’s hard to buy in today’s you-get-what-you-pay-for world. A quiet someplace to be. A chair, blanket, or cushion. Whatever will allow you to be comfortable and still for 5 minutes. If a quiet place is too hard to come by, headphones will work well in tandem with a meditation app. Legit. That is all you really need. Currently, I’m meditating for a whopping 4 minutes in the morning, using the guided mediation “Welcoming the day” on the Breathe app. But let me tell you, my mornings are so much nicer and it has been easier to take a few breaths throughout the day and release stress with that morning meditation as a foundation. Without using a meditation app, I highly recommend setting a timer. Then make yourself comfortable, and if it feels natural, close your eyes. Here’s the tricky part. You’re going to JUST breath and focus on your breath for 5 minutes. Breathe in and follow the breath into your nose, into your lungs, expanding your diaphragm. As you breathe out, follow your breath again. Breath in. Breath out. You will likely find yourself thinking about practically everything else but your breath. Simply allow those thoughts to move along and bring your focus back to the breath. Rinse and repeat until your timer dings and then it’s time to move on with your day! Yes, FIVE minutes can make a difference. Give it a shot this week. Let us know your thoughts and how you feel! This post does not contain any affiliate links. We will not receive any compensation for any traffic, downloads, or use of the applications recommended in this post. We have used them and quite simply find them to be wonderful, though we do understand that each person is unique and there are many, many options to choose from. We’re simply sharing our top 3 faves! “Maybe I’m going about this all wrong.” Have you ever felt like that? Life is full of roadblocks that we have to figure out how to clamber over, go around, or decide if they are worth either altering or abandoning our present course. I am currently working to re-tool my routines because they are no longer effective. Falls brings a myriad of changes, and sometimes change means adjusting to new norms. The sheer number of blog posts that I have now written but not posted is starting to get out of hand. There are various reasons, but at the end of the day I cannot deem any of them coherent and worthwhile. It seems, quiet possibly I’m trying too hard and going against nature. Plus, there are side effects to all of this: (a) I am discouraging myself (b) I am engaging in negative self talk and finally (c) I am creating a disjointed experience for everyone, readers included! That’s just not right. So I’m going to try a different tact. When inspiration, revelation, or other exciting “-ation” occurs, I am going to take you right along with me! Weeeeee! new. I tend to be a little behind on a variety of things (like I haven’t had cable anything in about a decade…). But I’m hoping you will bear with that little quirk, maybe get a laugh here or there, and possibly bring things that you really enjoyed or missed out on back to the forefront. But this is all a little beside the point. Change is coming! Change is here! I would appreciate your feedback, especially over the coming weeks and months. Suggestions and comments are beyond welcome! Here’s hoping to bring in new ideas, alternate viewpoints, and a bootyload of positive information and inspiration your way on a far, far more regular basis. Have you felt like there’s not enough time in a day to get all of the things that are important to you to fit in? That you have to continuously push them to tomorrow, and sometimes tomorrow never really comes? Or that you’re not ready for your next step? That you need to learn more, practice more, just be more? I hear you! I feel like that too! Sometimes with frightening regularity. On top of that, I just felt like there was no way there could be enough time in a day. I mean, how do other people do it?! Are they super-secret super-heroes? Probably not. But there are some people who just seem to be able to do it ALL. So I decided to implement some changes and see where they take me. And here we are! They have been working out so well, I couldn’t keep them to myself! Start where you are. Not where you think you should be. Not where you want to be. Not where you perceive that others think you should be. I am so serious about this. Don’t talk yourself out of it. If others aren’t positive, take a look at where they are coming from, but don’t let it stop you. Log it. Keep a time/energy/productivity log for a few days to a week. Be extremely honest, or you will only be fooling yourself. Take time to understand your needs and your strengths. And don’t only pay attention to where your time is spent, but also what time of day that you have the most energy, and when you feel the most productive. And most importantly, take note of your energy bank. What helps you recharge? What accelerates depletion in your energy levels? Balancing the drain and recharge of your energy levels is very key. Plan. Seriously make a plan. Make it part of your ritual to plan the upcoming day. Take time over the weekend to figure out what your week should look like. At the end of the month, take a look back before you move forward. What worked, what didn’t, what is changing in the upcoming month for you? Really put in the effort to find what works for you and stick to it! Use the tools that work for you. Maybe you are a paper and pen purist or an ecologically minded whiteboard user. Maybe you cannot live without your iPhone Reminders or your Google Calendar. Personally I am a giant fan of Post-its, a good planner, and lists. Oh, and habit trackers! Remember, if the tools don’t work, they will most likely hinder you. So change it up until it does work for you. Be mindful with your time. It is extremely valuable and you cannot get any of it back, no matter how hard you work. Keep a mental (or easily accessible) list and be prepared should some “free-time” appear in your day. I like to remember this principal that I read in 18 Minutes, by Peter Bergman, ‘“according to the Talmud [the Jewish book of law], if someone comes late to a meeting they are committing the sin of stealing – stealing the time of the person who had to wait for them. And it’s the worst kind of stealing because what is taken can never be returned.”’ Be careful to never put someone in the position where they can steal your time. For myself, I tend to save articles to read later (thank you Facebook) and carry a book with me whenever I perceive the possibility for an extended period of unplanned open time. Set boundaries. Everyone says it, because it is essential to living your best life. Take a look at that log that you kept and hone in on what wasn’t productive. See if you can cut down on the fruitless and replace with something restoring or rewarding. Maybe trade time spent passively using social media for texting or calling a friend that you’ve been missing. Or trade time spent watching TV for time engaging with your partner or family, reading, or exercising. And remember excessive time spent at or thinking about work ultimately will not increase your productivity, but time away can give you renewed energy and a fresh perspective. Simply put, don’t let anything crowd out the important parts of your life. Enrich your mind, body, and soul. Take a walk in a scenic park or part of town. Discuss an intriguing topic with a partner or friend. Read a book that just grabs your mind and transports you somewhere else. Take a break, dance, color, or watch a TEDx talk you’ve been meaning to catch. Make time to watch the sunrise. Write, play music, cook, create something uniquely you. Be sure to make time for the things that make YOU feel alive. Stop the negative self-talk. We all have weaknesses. All of us! Accept yourself as you are. AS YOU ARE. (See “Start where you are”!) Acknowledge the hard work that you’ve put into getting where you are. Accept that comparing your whole life to someone else’s presented life (social media, what you hear about, etc.) is just being incredibly hard on yourself. If you only looked at your highlight reel, I’m betting it would be pretty amazing too. But no one gets anywhere on just highlights. We have to put in the work to get to shine. Marathon runners don’t just pop out of the womb. Powerful CEOs didn’t get into business yesterday. And you will get where you want to, if you are willing to endure the trials and put in the time it takes to get there! Eliminate decisions. Decision fatigue is a very real thing. To combat the drain that routine decisions can have, decrease them. Meal plan over the weekend for your upcoming week, do the prep, and as the week moves forward, you will not have to worry about what’s for dinner because you already have it in motion. Pick your clothes for the week on Sunday and have them grouped accordingly. Make things that were choices, routine. I now plan out my exercise routine weekly and review each night what I’m doing in the morning before I go to bed. Automate what and where you can. Breath. Rest. Relax. Have you been reading this going, “lady, when do I just get to be STILL? !” I hear you! “You can’t pour from an empty cup,” and I don’t want you to! Self-care is extremely important. Knowing when you really, genuinely do need a break is key. There will be days where you are just drained, so recharge. Make sure you balance your energy levels. Know what drains them and what restores them. Also, always take a second to question whether you just don’t feel like doing something or if you are too tired to do it. Too tired, rest! Don’t feel like it? Could you move to a different day, swap it with another task? Remain open and flexible. I do function better when I have a routine and a plan. But I also recognize that sticking to it obsessively can result in more issues than benefits. I’d say, rigidity serves no wo/man, and it may cause him/her to break. Also, reevaluate where you are, your plan, and your needs as they change and evolve. Our lives are always changing and evolving, so we need to remain ready for those changes. “Pliability is life; rigidity is death, whether one speaks of man’s body, his mind, or his spirit,” Bruce Lee. I hope there were some positive take aways in this post for you, and I would love to hear from you! What helps you move towards and achieve your goals while maintaining life balance? Until next time, sending sunny thoughts! Quoting Rabbi Hayyim Angel in 18 Minutes by Peter Bergman. It may not be something that happens every day. However, I am certain that if you consciously look, you will see opportunities to do good for others present themselves fairly frequently. Take a short trip with me down the Boulevard and you may see. It’s early and sunny but cold and I have just made the prerequisite morning stop at Dunkin’ Donuts. I said “yes” to the combo and am happily snacking on the hot and tasty hashbrowns that came with my coffee and breakfast sandwich. I come up on a red light, as is so common on any city boulevard, and I take out my hot, heavenly scented breakfast sandwich so I can unwrap it. As I pull the wrapped sandwich out of the take-out bag, I glance up at the light and at the corner and see a man with a sign made from a scrap of cardboard. You know the man and the sign, because even in a country where so many are blessed to not be this man, there are still many in every town, city, and state that share his plight. I look at him and then I look at my still wrapped, hot, delicious, breakfast sandwich and I make the decision. I offer my sandwich to this man, this stranger, who is alone and standing out in the cold with his sign. He smiles hesitantly as he approaches my car and then, sandwich in hand he thanks me, wishes me a good day, and thanks me again. That is an opportunity. Am I saying that you should go to your local purveyor of hot, delicious breakfast sandwiches, buy some, and drive around searching for folks with cardboard signs to give them to? No, not quite. Although, I like where your head is at. I am saying that situations may present themselves more frequently than they are seen and acted on. Was I hungry? You bet. In a 14 hour window, those hashbrowns were the only thing I had eaten. However, that was my own doing and I could easily obtain my choice of food again. I was only at my own mercy. That man on the corner, I don’t know his story. I don’t even know his name. What I do know is that there is a pretty good chance that he doesn’t know when his next meal will be or where it will come from, and that by giving him mine, he has been helped. Good has been done. Will that small gesture solve his problems? Nope, but it will help him. If we all seek to do little things like this or spend time volunteering or being an advocate for change, we can make a huge impact on the world we live in. Be the good, folks. Be the good. 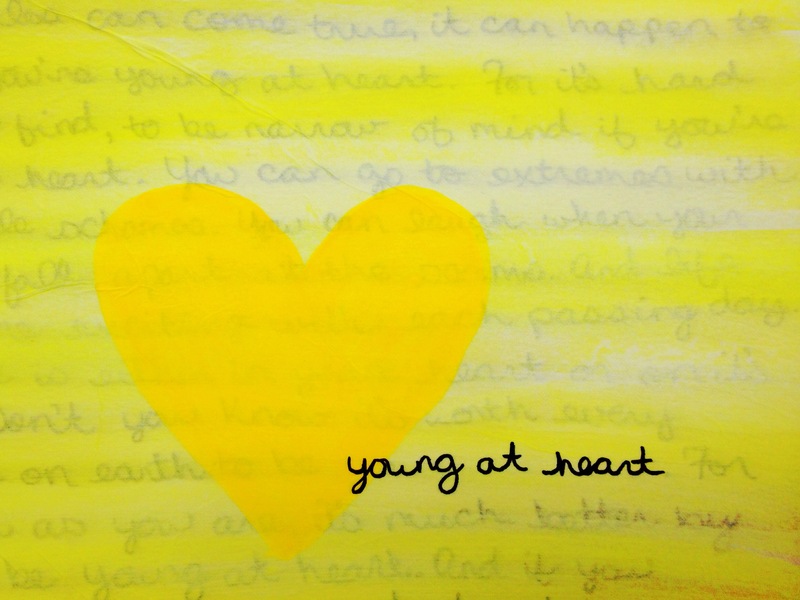 Are you among the very young at heart? Young at Heart, sung by good old blue eyes, is hands down my favorite song of all time. It always puts a smile on my face, pep in my step, and inevitably takes up residence in my head for days at a time. It is so darn catchy, I just can’t help it. And it’s so happy, I don’t want to. I love the thought, the message, the voice of the lyrics. Young at heart. My very most favorite people are just that. They color, in coloring books! They dance, everywhere- EVERYWHERE. They play Marco-Polo, while grocery shopping. They are delighted by the wonders of nature. They are curious. They play sports. They take things apart and reassemble them to see how they work. They get lost in books. They skip instead of walk, when the mood strikes. Their face lights up when Disney, soft-serve, or puppies are mentioned. They come up with amazing ideas and put them in motion. These people are also happier. They handle stress better. They know how to have a good time and, if you’re with them, you’re guaranteed a good time too. They make a habit of finding the bright-side. They are kind, caring, and compassionate. They are, unfailingly, among the most intelligent people I have the pleasure of knowing. “The point, what is the point?” you’re shouting. The point is, being young at heart is a lifestyle, a mindset, and a daily, hourly, minute by minute choice. It is much like happiness in that respect, and the two go hand in hand much of the time. You too can be young at heart. So today, go and be young at heart. Look up at the sky when you walk outside. Smile at a stranger. Link arms with a friend. Find the can, where you only saw can’t. Tomorrow, be young at heart. Draw a picture. Open your mind. Go for a walk. Laugh, truly belly laugh out loud. Be alive. Repeat. Again. And again. Get up earlier. Yep, that’s right. Get. Up. Earlier. Easy? No. Worth it? Yes! Give yourself time to REALLY wake up. Allow yourself to get your day started in a stress free, rush-less mind set. Are those extra 15 minutes of “sleep” that you are clinging on to by hitting the snooze alarm actually benefitting you? Why not try using that time to set your day up for success instead? Before you know it, you may start to look forward to getting up. Or maybe you will notice an improvement in your general mood and outlook. Your days may even seem to go smoother. You will never know if you don’t try! I challenge you to try getting up 15 minutes earlier for one full work week. Leave yourself a note next to your alarm clock as a reminder of the treat you have in store that morning. I double dog dare you to kick the snooze button to the curb next week! Are you a morning person? Every morning? I’m not. I do a lot of things to get me rolling in the right direction in the morning but the craziest thing I do is say, “Good Morning!” to all kinds of things that it’s not “normal” to talk to. And I say it out loud like I mean it! Just remember to say it like you mean it! If you say “Good morning…” the same way you’d say, “Meh, it’s raining,” it’s not going to make any difference. You will still feel meh.